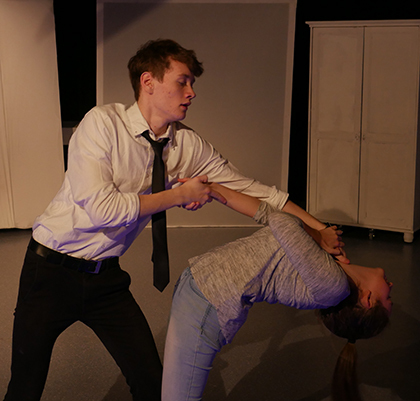 Drama students at The Sixth Form College, Solihull have been showing off their original devised plays to friends and family this week. Second year A level Drama students have been applying the techniques of professional theatre group Frantic Assembly, who visited the College some weeks ago to work with the students. Frantic Assembly are leading practitioners on the contemporary theatre scene, well known for their award-winning plays “Love Song”, “Things I know to be True” and “The Curious Incident of the Dog in the Nightime”. In the steps of their inspirational company, students have been focusing on hard-hitting contemporary subject matter and employing a mix of realistic dialogue and stylized ensemble movement. The subject matter of two of the plays they have been performing, “The Dangers of Being a Woman” and “Crazy Love”, have been inspired by the ‘Me Too’ movement and documentary research into sexual harassment and domestic violence. The third piece, entitled “Life Row”, has equally arresting material, set in the future in a society where the death penalty has been re-instated, inspired by a TV documentary about living on ‘Death Row’. Students have devised the plays from scratch in a team of six. The majority are actors, but four of the students are being assessed on costume, set and lighting design.